There’s a saying in the world of graphic novels that once one is written, its rights are immediately optioned to Hollywood. Unfortunately for gamers, that means those vibrant worlds of superheroes are often bastardized and shoehorned not once (into movies), but twice (into a video game) before being able to experience an interactive version, which is often short on production time and arrives in game stores way before it's polished. This, in essence, is the problem comic book-inspired video games have. 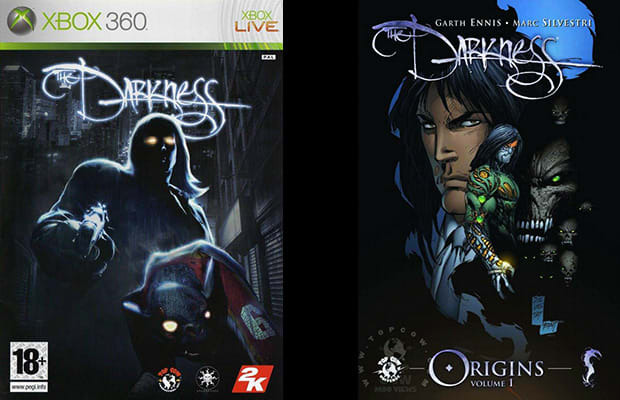 2K Games went out on a limb with their 2007 game The Darkness, which features a faithful rendition of Jackie Estacado and his quad-limbed body of destruction. Big shouts to Mike Patton, lead singer of Faith No More and designated video game voice mongrel (Portal, Left 4 Dead, Bionic Commando), who provides VO work of the malevolent-sounding "darkness." It’s so groovy, it’s outta sight!